SNAPPING TURTLE OR MAYBE PONDZILLA! Snapping turtle. A few years ago as I was making my rounds driving from one pond customer to another I was merging onto a busy highway from one of the local roads in my area. As I was coming up the on ramp to the highway I was stopped in my tracks but a huge animal looking very much like a dinosaur, in the road. I stopped my truck and watched in awe as this monster lumbered across the roadway towards the busy highway. This modern day dinosaur was snapping turtle. I am very familiar with snapping turtles and this specimen was easily and by far the largest snapper I had ever seen, it was enormous! I didn’t get out to measure it or move it, but I did hold up some horn happy members of traffic behind me while this predatory behemoth awkwardly made its way across the ramp. I also did not try to redirect the snapper as this guy seemed to have made up his mind on his destination and was too big to try to redirect anyway easily measuring in with a shell size of about 2 feet in length, its head and neck adding another 1.5 feet, and its tail also being about 1.5 feet gave this big ol’ reptile a good 4 feet of mobile real estate. And this guy probably stood about 2 feet the ground and I was not about to try to change his course; I kinda like my fingers. That snapper seemed to have his mind made up on where he was going, but unfortunately he did seem to be heading towards doom given his course was a bee line towards a busy highway. Once he cleared his way across the ramp I went on my way, the vehicles behind me were happy to see me move out, and who knows what happened to that modern day dinosaur. 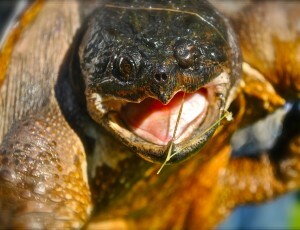 In my line of work I have run into snapping turtles numerous times (aaaah! Pondzilla!!). In my area I only see the common snapping turtle (Chelydra serpentine) but it has a cousin called the alligator snapping turtle (Macrochelys temminckii) that is found in more southerly states and can get larger than the northern snapper. Typically snappers will just try to slip away when I come across them while working on natural or naturalized ponds. From time to time they will try to make home in one of the ponds that I have designed and that is when I have to deal with them more directly and relocate them to somewhere else so my customers ponds do not turn into the local wildlife sushi bar. When the snapper is confronted is when one will see why they have the reputation that they have, because they do not quietly slip away when being removed from where they want to be. To the contrary, when I am removing a snapper they get aggressive and hold their ground. All of a sudden this still and quiet turtle is hissing, lunging, and snapping; talk about being two faced! When handling a snapper caution has to be taken. Snapping turtles can do quite a bit of damage if given the opportunity, easily removing parts of your body with their powerful jaws. They also have long flexible necks that allow them to give you that unexpected bite when you thought you were handling them well. Where gloves or capture with a net, only if you have to capture it. Snappers prefer mud ponds with lots of plant growth which they will eat, as well as carrion being their preferred food. They ambush hunt many types of prey and will attract and catch fish too. When snappers are found in your backyard designer pond, apart from your plants if you have them, they will certainly try to eat your finned friends, like the heron, so move quickly to get them out. 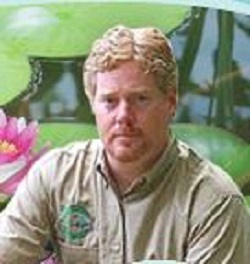 The snappers can possibly cause damage to your pond liner as well. Once you have captured them you have a decision to make, release it or cook it up. I recommend the release option; but in times not too far gone, and currently around the globe the snapping turtle is found on many menus. Yes, there are many recipes for this designer pond invader but I have none to share with you. In Native American cultures of the past the turtle was not only eaten, but every piece of it was used. The shell and other parts were important instruments of various ceremonies. The shell could be used as a ceremonial breast plate worn to protect from spiritual attacks. The snapping turtle had meaning and importance. Then along came the Europeans who pretty quickly hunted them into tiny numbers because of the popularity of turtle meat and turtle soup in the colonial days of America. Since those times the use of turtle meat has drastically declined and the populations of the common and alligator snapping turtles have done of good job of rebounding. Like many turtles the snapper prefer to lay their eggs in the same nesting areas year after year, so if you encounter a nest try hard to protect and preserve it. The snapping turtles lay their white leathery eggs in May and June typically and may produce from 20 – 40 eggs. The eggs will usually hatch in September or October. Once hatched from those eggs many snappers can live up to 40 years. In general snappers are pretty good looking turtles with earthy reddish brown color tones. It’s carapace (shell) has strong serrated patterns with a strong sense of geometry to them. Their legs look powerful and their claws seem capable of doing some damage. They have emotionless eyes which is a bit freaky, but not as bad as shark eyes! Of course the mouth is more of a beak structure with a nice point to it for grabbing onto its prey. Their longish tails do not retract into their shell, neither does any part of its body; and probably for that reason they were designed to be fierce. Like most turtles they prefer to be left alone, and are only aggressive toward humans when we make them have to be aggressive. I have yet to see a turtle come charging out of a pond after me, but when I go to poke them with a stick they aren’t having that and they have a very short fuse. Like most creatures I encounter in my work, I love the snapping turtles. They have a face only a mother could love, but their beauty is deep. Their disposition is peaceful until pushed otherwise, and I admire their character. Maybe there is a lesson to be learned from them. So the next time You come across a dinosaur in your travels it may very well be a snapping turtle. Given that the snapping turtles have been on this planet a few million years longer than us, I suggest you give the snapping turtles the right of way.